Benjamas Thai Restaurant uses their own specialised couriers to deliver their food. (Yellow Curry) Mild yellow curry cooked in coconut milk and potatoes, your choice of chicken, pork, beef and vegetables. Stir-fried vegetables with satay sauce and your choice of chicken, beef or pork. (Salad) Steamed mixed seafood, red onion, shallots, coriander, lemon juice, fish sauce and mild chilli. Soft shell crab with carrot, snowpea, baby corn, onion, capsicum, garlic and pepper. (Duck) Boneless roasted duck cooked in red curry paste with coconut milk, pineapple and vegetables. (Stir-Fried Duck) Stir-fried roasted duck with fresh chilli and vegetables. Soft shell crab with cashew nut, capsicum, onion and shallots, chilli jam. Steamed whole snapper in herbs topped with a fresh chilli, garlic, lemon and shallots. Deep fried whole snapper topped with mid curry paste, cooked in coconut milk, kaffir lime leaves and basil. Thai style spring rolls served with chilli plum sauce. Thai style marinated chicken wings served with chilli sauce. Thai style minced pork and peanut served with sweet sauce. Thai style minced chicken cooked with potato, onion and curry powder in a light pastry served with cucumber sauce. Famous Thai fish cakes served with peanut and cucumber sauce. Thai style barbeque chicken skewer served with peanut sauce. A combination of spring roll, curry puff, tod mon, peek kai and golden boat. (Gaeng Keow Warn) Medium hot curry cooked in coconut milk with bamboo shoot and green vegetables with your choice of chicken, pork or beef. (Gaeng Ped) Traditional Thai curry with coconut milk, bamboo shoot and red capsicum, bean, Thai basil, carrot with your choice of chicken, pork or beef. Cooked in coconut milk and mild chilli paste with your choice of chicken, pork or beef. (Beef only) Sweet mild curry from the South of Thailand with beef, potatoes, coconut milk and peanuts. Spicy country style curry with your choice of chicken, pork or beef. No coconut milk. Stir-fried mixed seafood with fresh chilli and vegetables. Stir-fried squid with chilli paste and vegetables. Stir-fried squid with garlic and pepper. Stir-fried king prawns with garlic and pepper. Stir-fried king prawns with Thai basil, fresh green beans and chilli. Stir-fried king prawns with cashew nuts, capsicum, onion, shallots and chilli jam. Stir-fried mixed seafood with cashew nuts, capsicum, onion, shallots and chilli jam. Stir-fried king prawns with fresh chilli, onion and shallot. Stir-fried king prawns with snow peas, carrot, shallots and red capsicum in oyster sauce. Thai style sweet and sour king prawns with tomato, cucumber, onion, capsicum and pineapple. (Green Curry) King prawns in tasty green curry with coconut milk and vegetables. King prawns cooked in curry paste, coconut milk, fresh chilli and basil leaves topped with kaffir lime leaves. Deep fried whole fish topped with our spicy sweet and chilli sauce. Deep fried whole fish topped with our Thai style sweet and sour sauce, onion, cucumber, tomato, capsicum and pineapple. Deep fried whole fish topped with fresh ginger, minced pork and vegetables. King prawns cooked in coconut milk panang curry paste and fresh basil. Steamed mixed seafood marinated in mild chilli paste, coconut milk and fresh basil. (Red Curry) King prawns in tasty red curry with coconut milk and vegetables. Thai style soup with mixed vegetables, lemon grass, lime juice and Thai herbs. Mixed vegetables soup in coconut milk with galangal, lemon grass and lemon juice. Deep fried bean curd served with peanut sauce. A selection of vegetables (capsicum, buckley and bamboo shoot) topped with satay sauce. Combination fried vegetables with soy sauce and oyster sauce. Combination fried vegetables with fresh ginger and soy sauce. Bean curd with vegetables, fresh ginger and soy sauce. Fried bean curd with cashew nut, vegetables, onion and special sauce. Fried bean curd with Thai style sweet and sour sauce, tomato, cucumber, onion and pineapple. Selection of vegetables (capsicum, buckley and bamboo shoot) cooked in coconut milk and green curry paste. Selection of vegetables (capsicum, buckley and bamboo shoot) cooked in coconut milk and red curry paste. Spicy vegetables jungle curry. No coconut milk. Your choice of chicken, pork or beef with fresh ginger, straw mushrooms and vegetables. Your choice of chicken, pork or beef with fresh chilli, garlic, onion and shallots. Your choice of chicken, pork or beef with basil and chilli. Thai style sweet and sour sauce with your choice of chicken, pork or beef. Combination vegetables with your choice of chicken, pork or beef. Your choice of chicken, pork or beef with oyster sauce and vegetables. Your choice of chicken, pork or beef with soy sauce, garlic and pepper. Fried chicken with cashew nuts, capsicum, onion, shallots and chilli jam. Famous dish of Thai rice noodles with chicken, egg, shallots, bean sprouts, carrots, peanuts, tamarind and lemon juice. Thick rice noodle wok-fried with Chinese broccoli, soy sauce and your choice of chicken, pork, beef or vegetable. Chef's special fried rice Thai style with chicken. Stir-fried wide rice noodles with chilli and basil in sweet dark soy sauce. Stir-fried wide rice noodles with cashew nut and chilli jam sauce. Thai style fried rice with king prawns. Thai style fried rice with mixed seafood. Spicy chicken soup with lemongrass, mushrooms, galangal, lime juice and coriander. Traditional Thai chicken soup with coconut milk, lemongrass, mushrooms, galangal, lime juice and coriander. Vermicelli clear soup with minced pork or chicken. 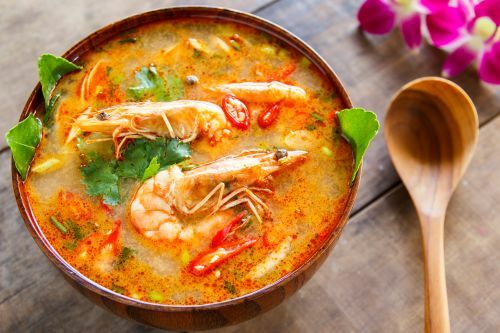 A famous Thai spicy prawn soup with lemongrass, mushrooms, galangal, lime juice and coriander. Spicy mixed seafood soup with herbs, lemongrass and lime juice. Spicy mixed seafood soup with lemongrass, mushrooms, galangal, lime juice and coriander. Traditional dish from North East Thailand lightly cooked with your choice of chicken, pork or beef mince flavoured with lemon juice, herbs and spices. Minced pork with lemon juice, fresh ginger, onion, peanuts and fresh chilli. Fine slices of grilled beef mixed with fresh chilli, lemon juice, cucumber, tomato and coriander. Spicy squid with onions, cucumber, tomato, lemon juice and herbs. Thai style salad of mixed seafood with lemon juice, lemongrass, chilli and herbs. Thai style prawn salad mixed with herbs, chilli, lemongrass, lime juice and mint.